A batch of Mom’s Icing, dyed whatever color you want! Preheat oven to 350 degrees. Grease and lightly flour two 9- x 2-inch round cake pans, then line the bottoms with waxed paper. In a large bowl, on the medium speed of an electric mixer, cream the butter until smooth. Add the sugar gradually and beat until fluffy, about 3 minutes. Add the eggs one at a time, beating well after each addition. Combine the flours and add in four parts, alternating with the milk and the vanilla extract, beating well after each addition. Fold in the strawberries. Divide batter among the cake pans. 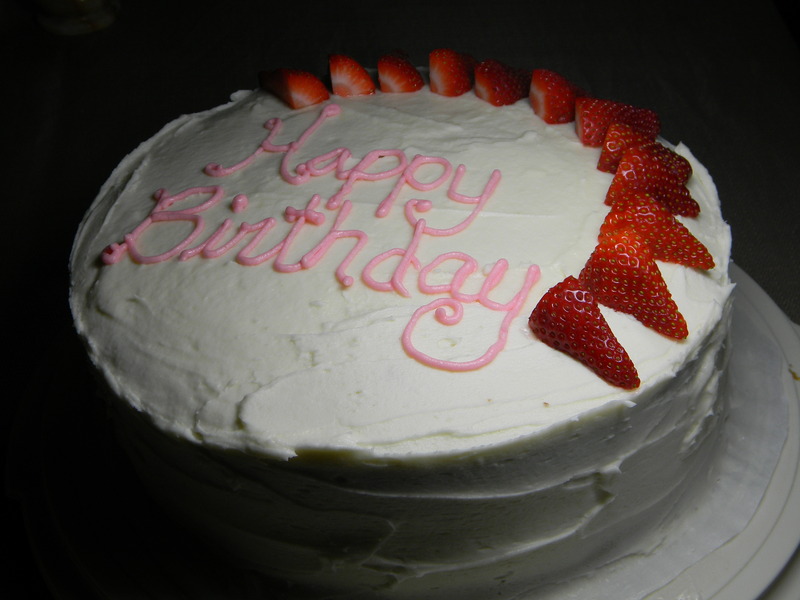 Bake for 20 to 25 minutes or until a cake tester inserted into center of cake comes out clean. 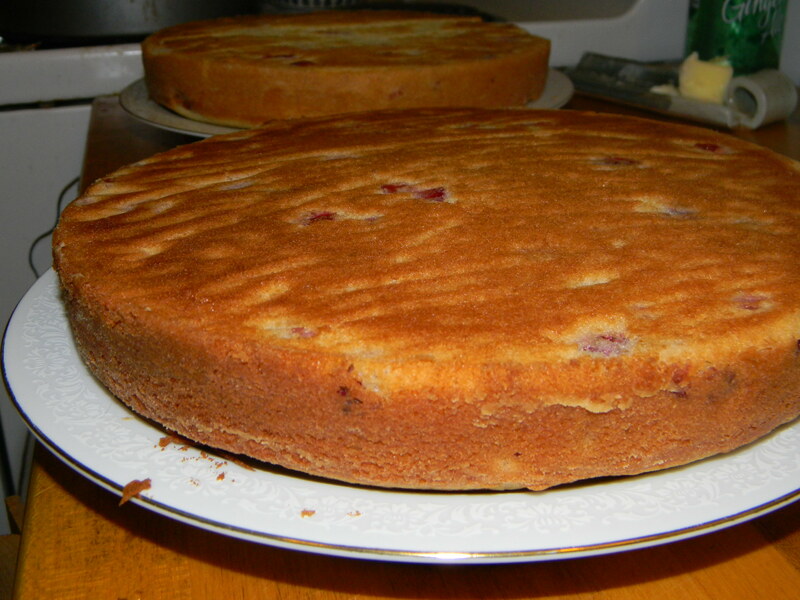 Let cakes cool in the pans for 10 minutes. Remove from pans and cool completely on wire rack. If you’re making cupcakes, line two 12-cup muffin tins with cupcake papers. Spoon the batter into the cups about three-quarters full. Bake until the tops spring back when lightly touched, about 20 to 22 minutes. Remove cupcakes from pans and cool completely on a rack before icing. 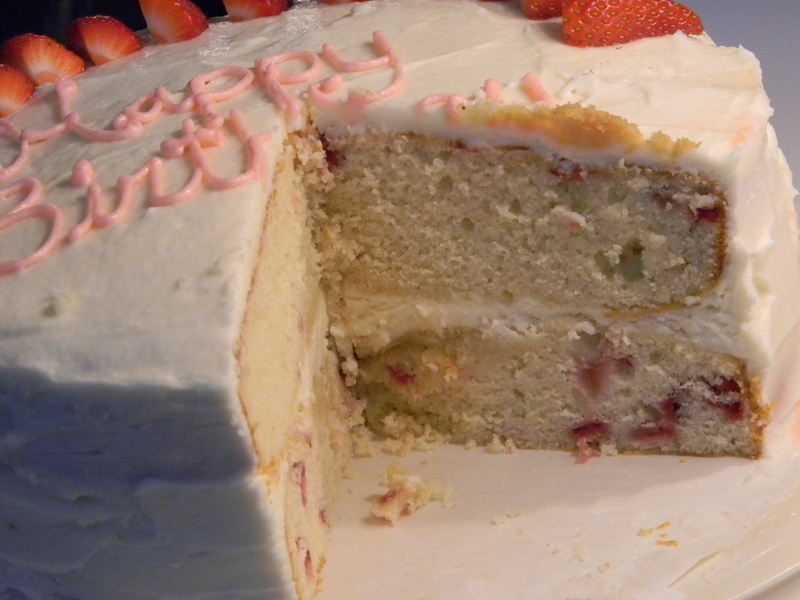 When cake has cooled, ice between the layers, then ice top and sides of cake.